Mensusa https://www.mensusa.com/articles/top-coats-for-men-to-serve-your-different-purpose.html Different Types Of Top Coats For Men To Serve Your Different Purpose The thing which has made its permanent place in the world of men's fashion is topcoats. Man's topcoats are available for every season and as www.mensusa.com knows your demand best, you will get more than hundreds of top coats for men while visiting us. 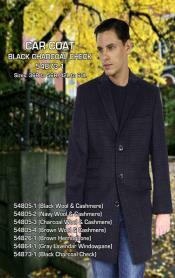 We also have a huge stock of chamarras de cuero which is the first choice of any man when they think to wear a topcoat. Different style in topcoat has the own purpose of it. Different topcoats have different lengths and different fittings and all are meant serve different purpose. There are blazer type top coat which can give you a dashy look with a little touch of formal look as well. These coats are ideal for summer wear as they are highly comfortable and light weight. But it is a quite obvious matter that a coat is needed much in the months of winter rather than summer time. And to protect you from the cold you have a large variety of top coats for men. In this list, the pea coat which is in vogue today comes first. This type of coat is perfect for office wear as it provides you a decent look. Another type of coat for your winter wear is double-breasted coat in which you are sure to look dashy as well as exceptional as it will hung up to your knees. This coat is incompatible for protecting you from the chilling weather. It is very important for everyone to have the proper knowledge of dressing according to the time and weather. While wearing something you should be very conscious about what are you wearing and in which time. But very often, many people make a blunder to select their outfit according to weather and the time. Now don't get into this group and select a top coat which is always in fashion and while discussing about top coats for men, you just can't ignore leather coat which is a must have in a gentleman's closet. It can be said without thinking twice that there could be found a single man in the world who does not possess the passion of wearing a leather jacket. A chamarras de cuero is able to enhance your style statement at any time. Either its day or night in a leather jacket you can be sure to look in your best. You can be sure to make a good investment on your clothing when you invest your money up on a abrigo de hombre because a coat can be used for any purpose. You can use a coat as your office wear as well as a party wear. It is also of your use if you are a rider or performer if you go for a sport coat. But selecting the color of your coat depends on which purpose you are going to wear it. And it is also quite easy to select the right color to serve your purpose properly as various colors options are also available there in www.mensusa.com of abrigo de hombre. And to carry proper accessories and selecting the right footwear with your outfit is very important for making your attire more attractive. Now it becomes easier for you to select the proper top coat for you among the huge range of top coats for men in www.mensusa.com. Buy a chamarras de cuero or an abrigo de hombre or any other top coat and be sure to become the centre of the attraction because a gentlemen's closet is not completed without a topcoat.